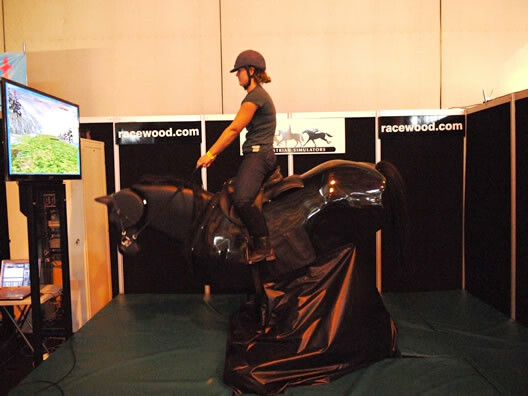 The Jumping Simulator is the first of a new generation of fully programmable interactive horse simulators, and the first in the world to provide a safe alternative to jumping, as well as a controlled environment for learning! Can you imagine how quickly you will progress in your skills through having the perfect schoolmaster? 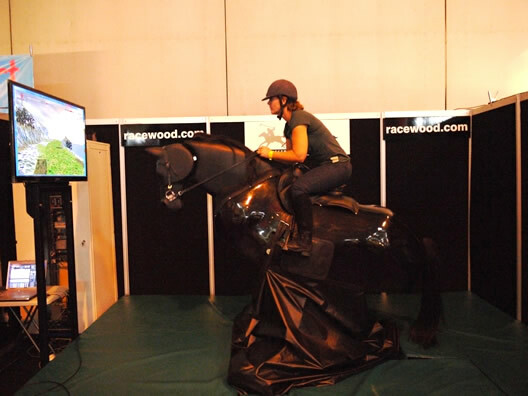 The Simulator can walk, trot, canter, gallop and jump! It can perform Cross Country at different levels, as well as Show Jumping. The Simulator has realistic movements in all gaits. The body, neck and head move independently and the different jumping actions are as close as you can get to the real thing. Leave your dreams and walk into the reality of what the jumping simulator has to offer! The reins are used to control the movement of the horse by steering around the course. Pressure on the reins controls the cantering pace of the horse when approaching the jump. The reins can also slow down or halt the horse at any time. The interactive screen displays ongoing feedback to the rider. The pressure on the left and right stirrups is measured continually throughout the ride. The on-screen feedback tells the rider if he or she is correctly balanced when jumping. The display on the screen will show how much the rider uses the neck for balance while jumping. These sensors provide feedback on the rider’s weight and balance when seated. Pressure from the legs is used to make the horse walk, trot and canter.